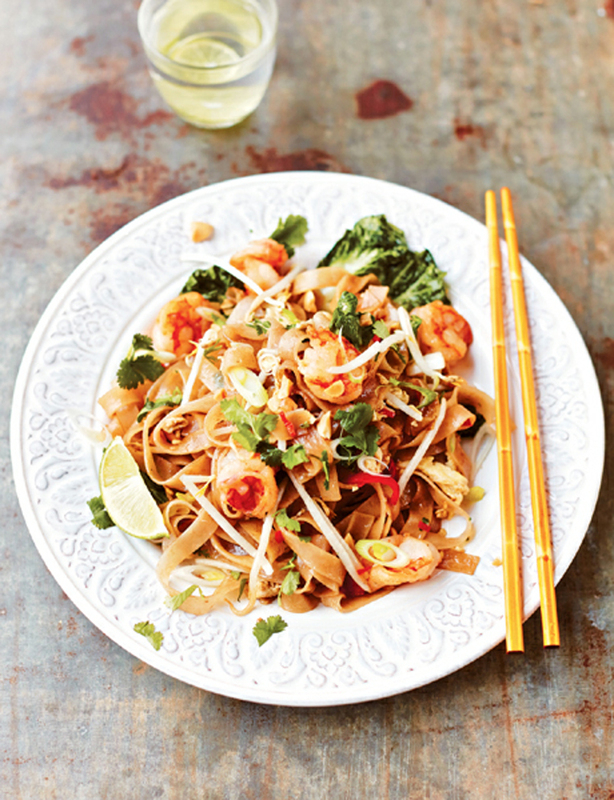 No book that claimed to be an authority of fish cooking would be complete without a recipe for pad Thai with prawns (shrimp). Wherever you are in the world you will find a prawn that could be used – they are all delicious! To make the sauce, mix the tamarind paste, brown sugar and fish sauce together with 4 tablespoons of water in a bowl, stirring until the sugar has dissolved. Bring a large pan of water to the boil, remove it from the heat, add the rice noodles and leave to soak for about 3 minutes until softened, or follow the instructions on the packet. Stir the noodles occasionally with a pair of tongs to keep them separate. Drain the noodles and rinse lightly under cold running water to prevent them sticking together. Heat 2 tablespoons of groundnut (peanut) oil in a wok over a high heat, add the prawns (shrimp) and stir-fry for 1–2 minutes until they have turned a deep pink. Remove the prawns from the wok and set aside. Add another spoonful of oil to the wok, pour in the beaten eggs and stir until the eggs are set. Remove from the wok and chop the cooked egg into small pieces. Return the wok to a high heat, add 2 tablespoons of oil and stir-fry the garlic, shallot and chilli (chile) for 30 seconds. Tip in the noodles, pour over the sauce and stir-fry for 1–2 minutes until the noodles have absorbed the sauce. Taste to check the noodles are tender and, if the sauce is too thick, add 1 tablespoon of water. Add the prawns and chopped egg, mix well and then add the pak choi (bok choy), bean sprouts and peanuts. Stir-fry for 30 seconds. Divide the pad thai between four serving plates and garnish with the coriander (cilantro) and lime segments to squeeze over.